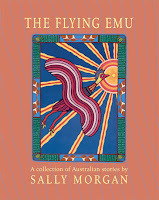 Sally Morgan is a well know Australian writer having written books for both children and adults. Her autobiography, My Place, is an Australian classic and has been published in a special children’s edition called Sally’s Story. This is a collection of her short, folktale like stories that she has written and illustrated. Her illustrations are gorgeous. Sally is a respected visual artist whose work has won international acclaim. She is represented in galleries in Australia, US and elsewhere. Sally is a descendant of the Palyku people of the Pilbara region of northwest Western Australia. In her preface Sally states that the stories in the book are not traditional ones although some were drawn from her childhood. Many read as ‘modern folktales’ and I particularly enjoyed Old Poker Face and The Laziest Seagull. She tells of her childhood memories of hearing stories and the importance they had in her life and encourages readers to have fun making up their own stories to share. 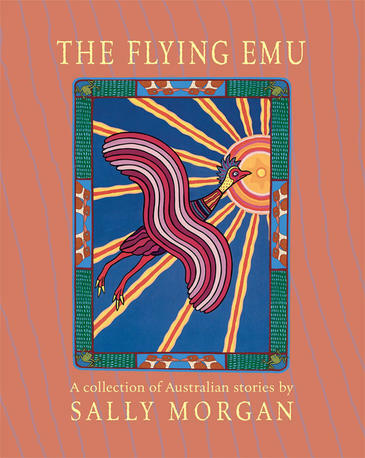 The stories include characters such as the moon, the sun, the planets, a vain emu, a young girl Jilji and her nemesis ‘Fatfella’ and the list goes on, all colourful characters that make for good reading. I enjoyed this collection very much. They are relevant for today, enjoyable, use exciting fun language and offer great colourful illustrations. This is another wonderful contribution by Sally Morgan and one to have on your shelf.